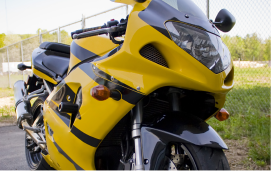 The Honda VFR1200F originally launched in early 2010 following 12 months of production and became the 7th generation sport touring motorcycle from Honda's VF and VFR line. An all-round safe ride thanks to adjustable suspension, the VFR1200F is another sturdy Honda design incorporating neat, solid panels that last the life of the bike. This particular model will be one of the first motorcycles available from Signature following our recent move to branch out into the market of motorcycle trading with a view to eventually expand further into bike servicing and repairs.